CGB has financially supported a community “gotong-royong” effort to build a student hostel at Kampung Marak Parak in Kota Marudu, Sabah. The people there wanted to ensure that their children living in the interior villages can attend school regularly. Some of them needed to walk one or two hours or travel very far by boat to reach their school. Absenteeism soars especially during bad weather seasons. The plan was to build a single storey hostel to accommodate about 40 to 50 students. Those from poor families living far away in the interior can stay at the hostel during school days. 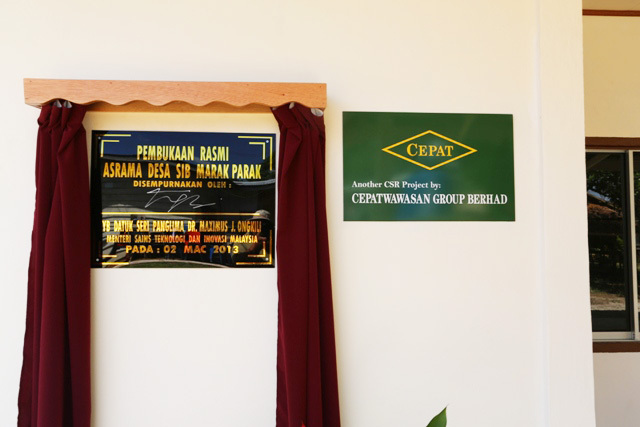 CGB donated the building materials for the semi-concrete hostel at Kampung Marak Parak while the villagers worked together to build it. Kota Marudu is located in the northern region of Sabah with a population of more than 80,000 people. It is a main town in the Kudat Division and has several schools. Students to benefit from newly built hostel.